Have yourself a 'natural' little Christmas! Unfortunately we are still living in an age of mass consumerism, where landfill and single use plastic are top of our conscientious minds. Over the festive period it is estimated that we in the UK generate 30% more waste than usual. Tons of wrapping paper and glittery Christmas cards will end up in landfill, around one in ten Christmas gifts are unwanted and will end up discarded. And even those thoughtful gifts that are treasured – how many are packaged in unnecessary amounts of plastic packaging? So, the theme of this years Church Park Flowers Pop Up Christmas Shop is natural, green and recyclable. 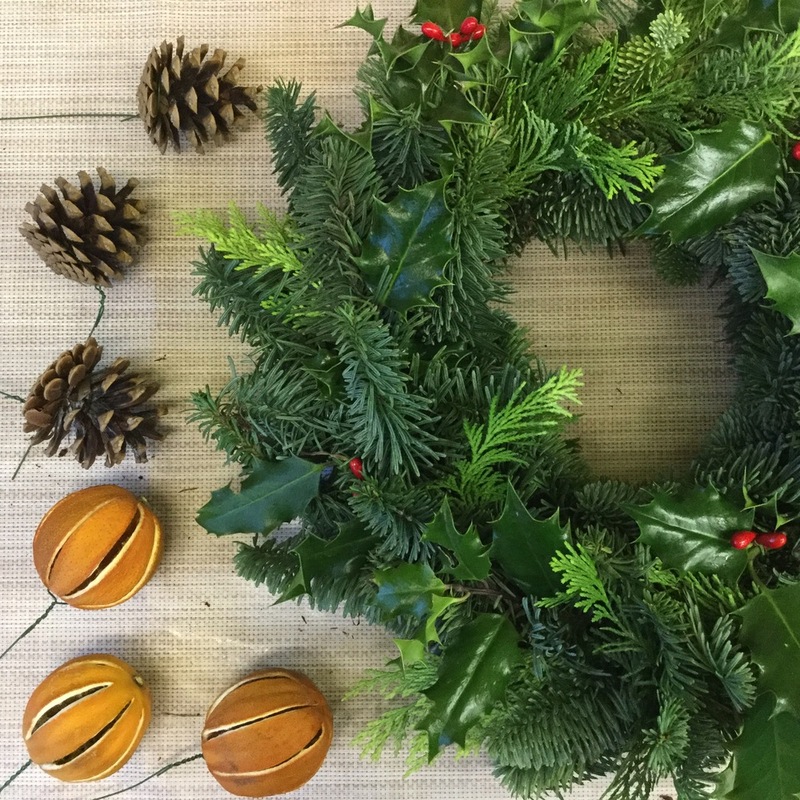 All Christmas wreaths are being made with British sourced sustainable moss and foliage – most of it local. The wreaths will be completely compostable with no plastic used. Table, centrepiece and tree decorations are all natural and recyclable and new for this year will be recyclable Christmas wrapping paper. Apparently last year we used enough Christmas wrapping paper to get us to the moon! (220,000 miles worth) with over 85% of it unrecyclable by local councils. The Church Park Flowers Pop Up Christmas Shop will be stocking a variety of recyclable gift wrapping and presentation ideas to make your gifts this year stand out in style whilst being kind to the environment. To follow through on this green and recyclable theme I’ve decided to republish last years Christmas Pop Up Shop blog post. I thought it was a good one – so why waste it!!? Posted on November 26, 2018 by Heather Eales and filed under Christmas, Workshops and tagged Christmas natural natural christmas wreaths wreath christmas wreath natural Christmas wreath recyclable wrapping paper plastic free christmas. 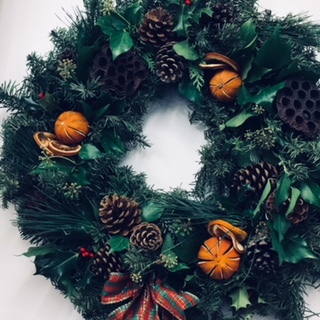 This the season to be jolly, and as the flower beds become dormant for the winter it is time to bring the outdoors in (or at least as far as the front door ) with the making of a Christmas wreath. Pine, holly, ivy, eucalyptus, poppy heads, daucus heads, berries, rose hips - all can be gathered in and wired together to make a natural, seasonal door adornment. Start with your wreath ring. Buy a metal one or fashion your own from straw or willow. Cover in moss - and there you have your starting base. Make small bundles of your foliage of choice and wire them onto the wreath ring, slightly overlapping each bundle as you go. Continue all the way round until the base ring is covered. Leave as is or add cones, dried orange slices, seed heads by wiring them in. Add a fabulous bow and your door will be perfectly dressed for the festive season. Need a helping hand or some more inspiration? Then come along to Church Park Flowers pop up Christmas shop and discover our world of wreaths. Ready made noble fir wreaths, fully dressed or all the sundries and natural supplies you need to make your own. Your can also stay for a drop in workshop to learn the tips and tricks for making your own wreath or door swag. Have yourself a natural Christmas at Church Park Flowers pop up Christmas shop, Butchers Row, Barnstaple. EX31 1BW. Posted on November 28, 2015 by Heather Eales and filed under Workshops, Christmas and tagged Christmas wreath handmade natural. I ‘stalked’ these people via social media and found a group of confident, knowledgeable, articulate and strong women that were coming from all over the country to stay at Lovelands in order to promote their message and they wanted little old me to show them how to make a flower crown? Yikes!! So I arm myself with buckets and buckets of foliage, florist tape, wire and ribbon and turn up at the spectacular Lovelands with their crazy glamping pods. Wow! The location is awesome, the pods are out of this world and ‘Sisterhood’? They really were the most inspiring, uplifting and beautiful group of ladies. I wanted to stay all day, I wanted to stay all evening, dam it, I want to be one of the ‘Sisterhood’ gang. I just need to learn how to blog. I showed them how to create foliage crowns and in return I picked up snippets about the blogging world. So truly fascinating – who knew that this form of communication could be so powerful, far reaching and motivating. From subsequent 'stalking' I can see how they each share in their own way their own loves, passions and experiences – how they want to tell everyone all about it and how they want to include everyone and encourage everyone to join in. Posted on June 30, 2015 by Heather Eales and filed under Workshops and tagged flower crowns glamping blogging.